This is Marklin 37082 Express Steam Locomotive Krauss-Maffei design for the German Federal Railroad (DB) class 10. Insiders only. Requires 10 years of Membership coupon from Marklin. No coupon or not 10 years, price is full, no discount. Model: This locomotive comes with a digital decoder, controlled highefficiency propulsion and sound effects module. 3 axles powered. 2 traction tires. The tender is constructed of metal. There is a close coupling between the locomotive and tender. The locomotive is ready for installation of the 72270 smoke generator. The headlights and smoke generator will work in conventional operation and can be controlled digitally. The running gear lights, whistle, and steam locomotive sound effects synchronized with the driving wheels can be controlled digitally with the 6021 Control Unit. Length over the buffers 30.5 cm / 12. The 37082 express train steam locomotive will be exclusively produced for those Insiders who have been members for 10 years. The new flagship locomotive of the German Federal Railroad was to shine not only with its technology, but also with its appearance. Consequently, the color design of the prestigious class 10 became quite an important issue. The participating locomotive builders submitted their drafts and color studies for a decision in the meeting of the factory committee on the August 4, 1955. In addition to color selection, particular attention was directed to design of the decorative striping and the smoke deflectors. 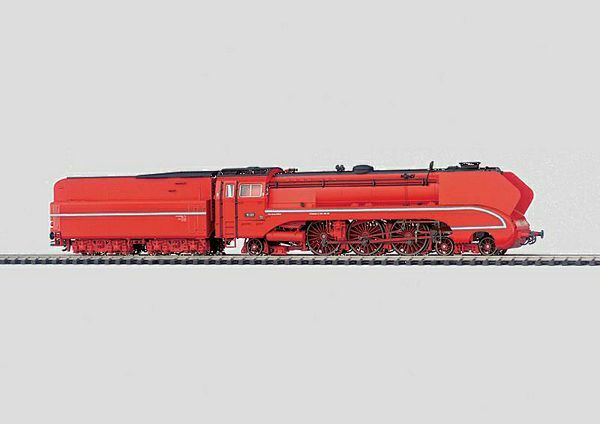 The study, designated TLO 54801, from Krauss Maffei showed a very dynamic and innovative looking locomotive in a red color scheme. The extremely large tear-drop shaped smoke deflectors with diagonal front line accent the forward thrust of the machine. However, in the following meeting on December 14, 1955, the committee was not able to decide on this design.